Our story begins on November 15, 1899, when Peter Sherlock Mulhearn married Alwine Louise Peters, daughter of Johann Ernst and Caroline Peters. Mr. Mulhearn worked for the Vicksburg, Shreveport and Pacific Railroad until 1912, when he became associated with his father-in-law in the undertaking and furniture business. In 1916 Mr. Johann Ernst Peters passed away and Mr. Mulhearn helped in the family's furniture store business. 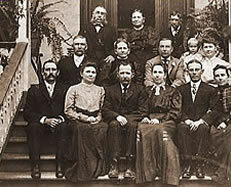 He, his wife, sons and daughters opened Mulhearn Funeral Home in 1929. It was only a short time before the Mulhearn family began its expansion during the mid 1930s to Rayville, Delhi, and Winnsboro. Along with the funeral homes, an insurance company, flower shops and an ambulance service were opened in the respective locations. In 1966, the ambulance company was closed due to liability insurance and governmental regulations, but another funeral home and flower shop were added in West Monroe, Louisiana. In 1971, Tom and Marie Mulhearn along with their four children, Thomas Henry, Jr., Peter G., Joseph E. and Barbara, purchased the company from Tom's brothers and sisters. In late 1970s Tom and Marie's oldest grandson, Mike, who had been coming to the funeral home with them since he was about six, joined the company. During the 1980s they added another funeral home in Monroe, as well, another generation of the Mulhearn family joined the workforce, Shelly Mulhearn Holloway, Peter G. "Butch" Mulhearn, Jr., and Thomas H. Mulhearn, III. In 1986 the Mulhearn family purchased Monroe Memorial Park Cemetery, now known as Mulhearn Memorial Park Cemetery, thus adding another aspect to better serve the families in our community. Starting in the late 1990s, our sixth family generation joined the business: Mike’s son Michael and Barbara’s son Mark. We have recently completed the construction of an additional 366 mausoleum crypts and 80 cremation niches to our existing air conditioned chapel mausoleum to better serve the needs of the families of Northeast Louisiana. We always strive to provide quality services and products that families expect. We are very proud of our strong heritage in this industry and in our community, that’s why you see our family members personally involved in the day to day operations of our business. "When You Need Us Most"
We strive to treat every family as they were a part of our own.